At Meadowlark 1939, we are committed to maintaining the highest quality of service, care, and personalization, which is why we only host a select number of weddings each year. The estate offers both indoor and outdoor event venues with 13 acres of formal gardens for your guests to wander, a historic home for preparations and intimate gatherings, pool side celebrating, and a 100 year old pecan tree that will captivate. Whether your wedding calls for grandeur or intimacy, we guarantee, with unwavering assurance, that Meadowlark 1939 will host the event of your dreams. Set upon many magnificently wooded acres near Stone Mountain in Gwinnett County, Vecoma is the perfect waterfront location for weddings, corporate events, receptions, banquets, and formals. Today, the family of Venie and Cotton Mather invite you to enjoy Vecoma as you celebrate your own historic and special event. As you walk the grounds, you can see the foundations of the old farm, the Yellow River; and you might even get a glimpse of deer and other wildlife that inhabit the densely wooded land. Premier Event Hall is located in the beautiful city of Duluth in the state Georgia. The Hall is committed to offer you the great service at the best price, and at every point to all our customers. We are able to accommodate your event and help make the event of your dreams become a reality. It has 2 elegant banquet rooms in 1 convenient location to accommodate both small and large events. The Emerald Hall can hold up to 300 Guest capacities. Sapphire Hall can host up to 100 guests. Our venue is ideal for any type of event! Whether it is Birthdays, Wedding Receptions, Graduation Parties, Religious Events, Sweet 16s, Luncheons, Bar/Bat Mitzvahs, Holiday Celebrations, Anniversary Parties, Welcome Back Parties, Special Occasions, Wedding Ceremonies, Corporate Meetings, Reunions and many more. Our trained and friendly staff is committed to planning the Event of your dreams! Casablanca is classy, elegant & spacious, the perfect place for all your private, community and corporate events. If you are looking for a breathtaking, glamorous indoor space for your next big event in the heart of Alpharetta, your search ends right here. At this facility, we want you to take the center stage and leave all the planning and logistics to us. We have 3000 plus square feet of well designed, elegantly decorated event hall with hi-tech features and special emphasis on customer service. The facility features full bar, dance floor and lighting TV, projector kitchen and preparation area .Our professional staff will make sure that your event is a great success. The Grande located in Kennesaw, GA, is a beautiful Victorian-style house surrounded by 2.5 acres of landscaped grounds. Offering lush and romantic outside garden weddings and inside receptions characterized by rustic elegance, The Grande is an all-inclusive wedding venue. On the main level, there is a big, open room with several seating areas. There is room in the entry for gifts and a guest sign-in book. A covered balcony overlooks a peaceful garden. You will love the warmth and beauty from the time you step inside the house. Outside there is a beautiful Cedar pavilion right next to a open gazebo with a decorative path, on either side of which there are seating plots that offer beauty and comfort to your outdoor Wedding. There are great photo opportunities to capture your magical wedding moments including a beautiful swing with a cedar frame and a fountain. What sets The Grande in Kennesaw apart from other venues is simple. Our all-inclusive package pricing is just that: All-Inclusive. There are no hidden fees. All taxes and gratuities are included. Return to Royalty Banquet Hall is located in the West End, a few minutes walk from Downtown Atlanta. The Hall offers 3 meeting spaces for social events as well as corporate events and meetings. The main banquet hall can accommodate events as large as 400. Come take a tour of our beautiful facility today. Walk-ins welcome! When only the charm and style of the Old South will do for your Georgia wedding, Rosabelle Manor is the destination for your special day. Located in historic Adairsville, this antebellum-style wedding venue provides the perfect backdrop for your treasured memories. Located just 45 minutes north of Atlanta in historic Adairsville, Georgia, Rosabelle Manor is a wedding venue that exudes southern charm. The manor provides an intimate location and ambiance, perfect for your Georgia wedding or special event. With authentically restored rooms and luxuriously designed Bride and Groom Suites, this metro Atlanta wedding venue was remodeled and furnished with your wedding in mind. Our high standards in excellence and service will become evident as we strive to offer you satisfaction and success in your event. Your vision is our vision, and each event will be meticulously planned and created as if it is our very own. 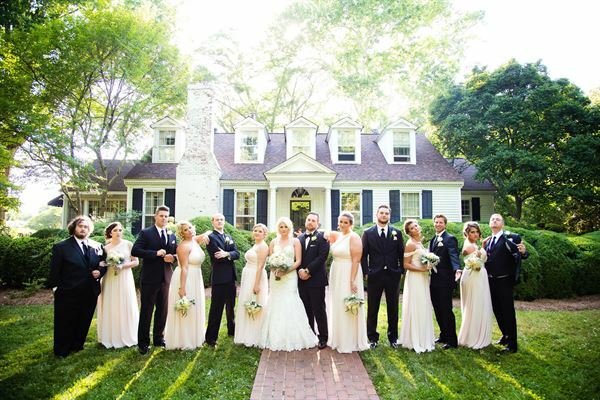 We look forward to showing you all that Rosabelle Manor has to offer for your wedding or special event!